Get up-close-and-personal with an endangered California condor chick on a live-streaming nest cam direct from the remote mountains near Hopper Mountain National Wildlife Refuge. 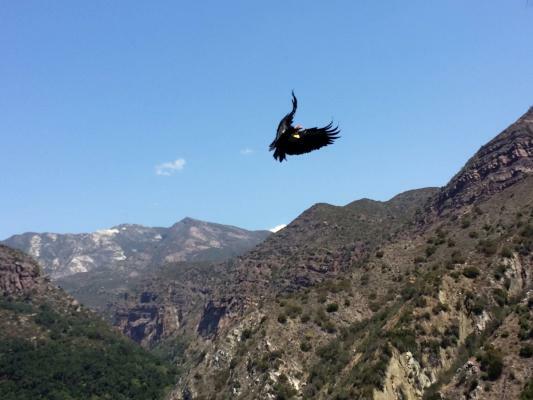 That's about 30 miles, as the condor flies, from the Santa Barbara Zoo, which is collaborating with the U.S. Fish & Wildlife Service and Cornell Lab of Ornithology to bring this real-time video feed to the public. The pair raising California condor chick #871 is eight-year-old female condor #513 and 18-year-old male condor #206. The pair used this same nest site in 2015 and this is their third attempt at nesting together. This is their first year to be featured on the livestreaming nest camera. The nest has been nicknamed "Devils Gate Nest" for the rugged area where it is located. Last year’s Condor Cam's live feed of the hatching of a California condor chick gained worldwide attention – nearly 1 million views from 150 countries and 19 million minutes, or 36 years of watch time. In 1982 there were only 22 of these awe-inspiring birds with massive 9.5 foot wingspans left on the planet. Now there are more than 400, with more than half flying free and nesting in the wild!